I do not remember if I ever mentioned it, but Downton Abbey's sixth season, which is slated to start around September, will be its last. It is ending because, per sources, the cast contracts are coming up and they want to move on to new projects. "Millions of people around the world have followed the journey of the Crawley family and those who serve them for the last five years. 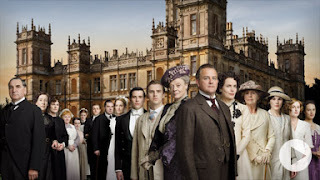 Inevitably there comes a time when all shows should end and Downton is no exception. We wanted to close the doors of Downton Abbey when it felt right and natural for the storylines to come together and when the show was still being enjoyed so much by its fans. We can promise a final season full of all the usual drama and intrigue, but with the added excitement of discovering how and where they all end up…"
I never quite got into the show. Yet. But there's always time to binge watch and play catch up, right?